From the Macy’s Thanksgiving Day Parade to its annual appearance at the Indianapolis 500 auto race, Purdue University’s “All-American” Marching Band has been at the heart of celebrations across the United States (and the wider world) since 1886, less than twenty years after the University itself was founded in central Indiana. While the marching band is the musical flagship of the University, the Department of Bands also includes jazz and concert ensembles as well as a symphony orchestra. Every year, hundreds of young men and women are welcomed into this community of music, and alumni range from astronaut Neil Armstrong to popcorn legend Orville Redenbacher. 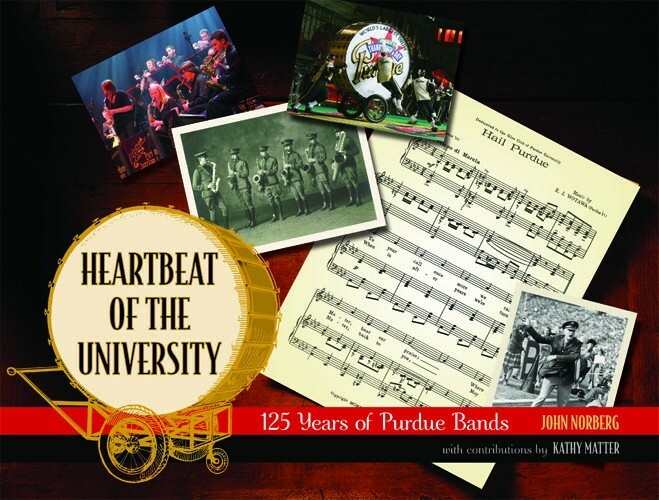 Celebrating 125 years of Purdue Bands, this beautifully-illustrated book traces the history of Purdue University’s Department of Bands from its humble origins as a drum unit for the student army training corps to the 2010 appearance of the “All-American” Marching Band as leader of the Macy’s Thanksgiving Day Parade in New York, seen by over fifty million television viewers. It follows the lives of the organization’s members and legendary directors, such as Paul Spotts Emrick and Al G. Wright, and highlights some of the band’s iconic features, such as the “World’s Largest Drum” and its legendary twirlers; the Golden Girl; the Girl in Black; the Silver Twins; and the Goldusters. Beyond the glitz, the story includes tragedy, such as the Halloween day train collision that claimed the lives of seventeen people in 1903, as well as groundbreaking success. But, through it all, the beat of one of the Midwest’s great treasures goes on, bringing fulfillment to its members as well as inspiration to its myriad fans.